It’s actually sadder than it’s been in decades that we Americans don’t get French cars. So many of them are so good right now, from the Citroën Cactus to the Alpine A110 to the crazy handsome Peugeot 508. 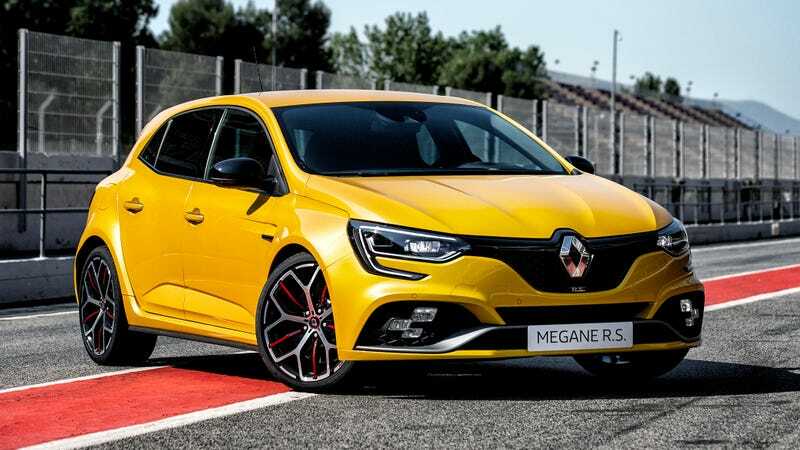 We can add another piece of delicious forbidden fruit to that modern list: the new Renault Megane RS Trophy, the hottest Renault hot hatch in the lineup. Can it unseat the Honda Civic Type R and the Ford Focus RS? On paper it looks promising. If you don’t keep up with French hatchback news—in which case, I am disappointed in you—the fourth-gen Megane dropped a couple years ago, but the hot RS version just came out at the beginning of this year. The Megane RS boasts 276 horsepower and 288 lb-ft from a 1.8-liter turbo four, front-wheel drive and a bevy of performance enhancements. So this car, the new Megane RS Trophy, is what you get when the standard Megane RS isn’t hot enough. Here it has 296 HP and 295 lb-ft of torque, or an eyebrow-raising 310 lb-ft if you opt for the dual-clutch gearbox over the manual. The zero to 62 mph time is in the mid-five second range for the manual. According to Top Gear, Renault claims it uses F1-inspired technology like a low-inertia turbo that enables a power boost despite lower emissions. Then again, that may not be the best comparison to draw there. Other tweaks to the Trophy include Recaro racing-style seats, stiffer shocks and springs, Brembo brakes, stiffer anti-roll bars and lighter wheels. The other party trick is Renault’s 4Control four-wheel steering, which Renault claims improves stability and agility and gives the car its primary edge over the Type R.
That’s a bold claim to make, as the Type R happens to be very good, and engineered to eliminate many of the drawbacks you get in a powerful front-driver. Anyway, the Trophy seems a good package, and it’s anticipated to sell for a bit less than the Type R does in the markets where it’s sold. Which isn’t here, sadly. I hope you all get a chance for some seat time, somehow, someday.